FIGURE 5-13 Summary of some of the major controlling factors on the secretion of hormones from the pars distalis. Factors encircled by ovals are releasing hormones-factors. Factors enclosed by hexagons are neurotransmitters. + effects are those that augment the secretion of the anterior pituitary hormone; - effects are those that decrease the secretion of the anterior pituitary hormone. Abbreviations: ENK, enkephalin; MTN, melatonin; DA, dopamine; 5-HT, serotonin; NE, norepinephrine; MRF, melanocyte hormone-releasing factor; MIF, melanocyte hormone release-inhibiting factor; CA, catecholamine; HA, histamine. See text for other abbreviations. Some of the effects shown here are controversial. ate cyclase activity, PI cycle activity, and calcium utilization and transport. Multiple D2 receptors may evolve from alternative splicing events to explain these broad effects. Estrogen blocks DA inhibition by its positive action on the PRL promoter or by other direct effects. The cloned DNA sequence encoding GnRH precursor protein contains an associated peptide called GAP (GnRH-associated peptide). This peptide was found to be an inhibitor of PRL secretion and may be a candidate for PIF. FIGURE 5-14 How anterior pituitary hormones that share a similar subunit (TSH, FSH, LH) specify receptors on different cell types. During stress, ACTH, fi-LPH, and ^-endorphin are released simultaneously from the corticotroph (see also Chapter 10). /3-Endorphin appears to interact with the /¿-receptor, which mediates the release of PRL from the mammotrope. The opiate peptides probably stimulate PRL release by inhibiting DA turnover and release by the TIDA pathway. GH is probably released in addition to PRL as a result of the action of ^-endorphin. A serotonergic pathway may cause the stimulation of basal PRL levels in the anterior pituitary as diagnosed by p-chlorophenylalanine methyl ester, an inhibitor of serotonin biosynthesis, and by metoclopramide, which stimulates PRL release. The structures of these compounds are shown in Figure 5-18. Thus, at least two pathways are possible for the regulation of PRL release. A positive pathway operates via a serotonergic mechanism, and a negative pathway operates via a dopaminergic mechanism. A number of factors influence the secretion of PRL and GH. These are summarized in Table 5-3. PRL receptor occurs in a wide variety of cells and tissues. PRL receptor is located in the cell membrane, but surprisingly has also been found in endosomes, Golgi apparatus, and lysosomes (degraded receptor has already been discussed). There is also a soluble protein with binding properties similar to those of the membrane receptor, and this form is found in liver, kidney, and mammary cytosols. PRL and GH receptors belong to the hematopoietic-cytokine receptor family shown in Figure 5-19. 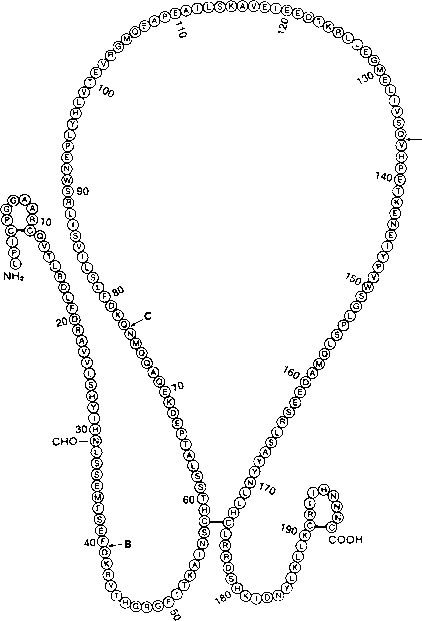 The PRL receptor consists of an extracellular domain (210 residues) with five cysteines, a transmembrane domain (24 residues), and a cytoplasmic domain (51 residues). PRL and GH receptors are localized on human chromosome 5. Members of the hemapoi-etic receptor family are structurally similar in ligand-binding domains but not in cytoplasmic sequences. A fibronectin-like domain occurs in the extracellular domain next to the membrane (Figure 5-19). Mammary gland (rabbit) has a longer PRL receptor than the liver form, and the long form is also present in human. Liver contains the highest number of PRL receptors. The long form of the receptor appears to be involved in the transcription of genes specifying milk proteins. The short form of the receptor may internalize PRL into specific cell types. FIGURE 5-15 The human PRL molecule. The human PRL amino acid sequence is displayed in the single-letter amino acid code. 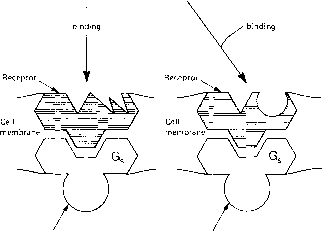 The lettered arrows indicate the points at which the coding region of the PRL gene is interrupted by introns. 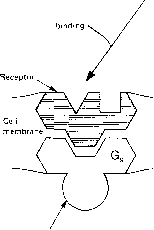 Intron A, located in the signal peptide, is not shown in this diagram, which depicts only the mature protein. The N-linked glycosylation site at residue 31, asparagine, is indicated by CHO. Reproduced with permission from Cooke, N. E. (1995). Prolactin: Basic physiology. In "Endocrinology" (L. J. DeGroot, ed. ), 3rd ed., Vol. 1, pp. 368-393. W. B. Saunders Co., Philadelphia, PA.
receptor could need to be dimerized also to generate the active form. Although it has been shown that PRL binding to receptor is followed by a rapid stimulation of tyrosine kinase activity, the molecular weights of protein substrates rule out PRL receptor itself as one of the phosphorylated products.